Thats a good tradition to send invitation cards to all those whom you want to see on some special occasions. Its so pleasant to receive these creatively designed cards, and thats the reason they are in great fave. Online stores are the right place to find a variety of them, and here is the refined design for the one. Its romantic style and delicate color scheme invites people in and offers to browse the whole arrangement of products. Using categories search and dropdown menu, the visitors will easily make choice and come back for more. Get this theme and make it work for prosperity of your business. Make sure you check the version of OpenCart this is compatible with before you buy this as its for a very old version OpenCart. Wonderful templates at the best prices! With the help of this theme, we are able to get a visually tempting and fully functional e-commerce web site. The design is so diligent and creative, The rightful mix of creativity and functionality has created an attractive web site for at reasonable price. We are particularly impressed by the technical support of their professional team. Thanks to them for the incredible job! I bought this template for my wife and She&#039;s going to use it for selling clothes. Installation was pretty easy, I did not had to contact support. 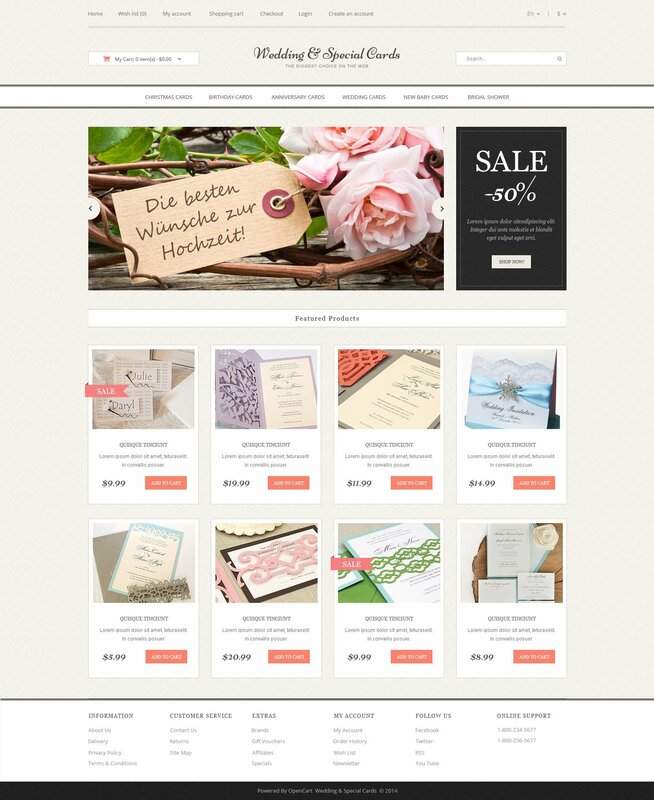 It&#039;s shame that this template is not compatible with the newest OpenCart version, but anyhow We are satisfied with it. I would prefer bigger social buttons / icons. There are some, but only in footer of the page. I have to add those icons manually to the top of the page.